Farewell service for Reverend E. Richards at Harston Baptist chapel, who is leaving to take up a new post in New Zealand, on account of his wife’s delicate health. Tea and meeting; 100 persons attended, Mr RJ Moffatt presiding. £70 was raised towards the cost of Reverend Richards’ & wife’s travel, also £20 cheque & a bible. ‘Deeply moved’ etc., and it was noted that the chapel and school had been extensively renovated during his incumbency. Reverend HF Griffin, GH Jones, W Higgins & J Brownhill also spoke. B.T. Thurgood & Sons, auctioneers, sale of The Queen’s Head, Harston, by the will of the late Christopher Wedd. It ‘does’ 180 barrels pa, Mr Edward Ashley is the present tenant, it is let to him with 3 months notice. Court case, Matthew Flack, 48y, of Thriplow, was charged (by PC Hackle and Superintendant Whitechurch) with begging in South Cambs villages including Harston, and was drunk and ‘pretended to be ill, to gain sympathy’. He had been ‘tramping around for 20 yrs’, was sentenced to 6 weeks prison/ hard labour. Baptist chapel, Rev SH Akehurst, the former pastor, preached, and held a funeral service for the late Mrs Miriam Thompson, 78y. At an ‘Occasional court’, Samuel Bunn was convicted of assaulting Kate Beaument, 13y, and sentenced to 3 months hard labour. Harston Ancient Shepherds’ Benefit Society held its anniversary meeting at the White Swan Inn. It nearly coincided with the ‘M.U.I.O.F.’ (Oddfellows), anniversary of the Loyal Victoria Lodge No. 3,737, held on 10/7 at The Green Man. 47 members had dinner, chaired by Bro. F. Williers N.G., with Bro. S. Newling, P.G. as vice-chair. Songs were sung by Kidman, Coe, Northrope, a cricket match was played,including J. Wright, E. Northrope, E Ashby, H. Northrope. Queen & royal family were toasted at supper. T. Peachey & H. Lawrance were praised for ‘supplying the wants of the brothers’. Death of; Mary Ann Churchman, 63y, on 1/7/90, and of George William Willers, 75y, on 5/7/90. Cricket, Trinity College Servants easily beat Harston, the Harston team being Hodson, Mason, Rev Ellaby, Whitechurch, Howe, Runham, Ling, Marshall, Meuel, Brown, Jones. Liberals meeting at the Baptist chapel schoolroom, Mr Hoare spoke about ‘The Irish Question’ etc. Marriage of Lizzie Northrop (Harston) to William Mann of Ipswich. Marriage of Susan Newling of Harston to James Drake of Wymondham. Fred Butler, gardener of Harston was fined (1s + costs) for failing to report swine fever on his premises. To Let: The Green Man, pub with stabling, fully licensed. At the Baptist chapel, the Reverend F. Potter, the new minister, lately arrived from Nova Scotia, preached on ‘New Testament Baptism’, advocating full immersion, 6 persons were immersed at the service. Tea meeting held in the school room, ‘Young People’s Society’ (50 members) addressed by Reverend D Bruce, Reverend William Higgins and Mr John Watson. David Wisbey presented the president (Reverend Potter) with an inscribed inkstand. Weeknight services have been introduced, the Sunday congregation had ‘improved’. Collection, £7 17s 6d, donated to the Baptist Missionary Society. Death of Harry Lawrance, 32y. Cricket, ‘Foulmire’ beat Harston, whose batters scored 7 ducks, highest score = 4. Funeral of Mrs Durbin, widow of late Reverend F.J. Durbin She was interred in the family vault in the parish churchyard. Chief mourners were, Miss L. Durbin; Miss A. Durbin; Miss Cooper, Reerend, J. Hamilton, the house servants & others. ‘Nearly every shop and house had their shutters up & blinds drawn’. Also attending were: Reverend Conybeare (Barrington), Reverend Ward (Hauxton), Reverend Potter (Baptist chapel), Mr & Mrs Midelton, Mr & Mrs Rowley, Mrs Peck Mr & Mrs T. Hays, Mr & Mrs T Smith, Mr & Mrs Wallman, J.J. Briscoe JP (etc). The coffin was of polished oak with an inner lead lining & elm shell. The funeral arrangements were made by Mr F. Willers of Harston. Wreaths from Mrs Chapman, Mr & Mrs Puck, Mr Levitt, Mr Ives, Mr & Mrs Hodson, Mr & Mrs Coleman, Miss Hurrell, Mr W Fisher etc. Harston Sunday School anniversary – sermon – song ‘’Left Alone”, sung by the scholars & choir, conducted (and trained) by Miss Watson, with the service given by Mr Thompson. Collection = 8 guineas. On Tuesday, the scholars & teachers paraded with banners and flags, then had tea, of bread & butter, cake. Then, sports, & before leaving, each pupil received a packet of sweets, half a pint of nuts, and a bun. Baptist Sunday School, tea etc, collection £8 8s. FredBarker, labourer, fined for being drunk & disorderly and assaulting PC Huckle, 12s 6d + 25s costs. Miss Ada Durbin wrote a ‘Women’s Column’, promoting ‘annuities for persons over 40, reduced to poverty thtrough misfortune’, and ‘country holidays for poor london children’. The Rector of Harston is now Reverend E.C. Baldwin MA. A concert was given at The Boar’s School in aid of Harston Cricket Club. Ingle Cox, Albert Harding, Henry Ashby and Edward Newling (labourers), all fined for being drunk & disorderly, 2s 6d + costs. Dr Midleton of Harston was called to an accident in Foxton. Matthew Cole of The Coach & Horses pub (publican, groom & gardener), bankrupt, had ‘a receiving order’ made against him. An accident had stopped him from working and his wife is seriously ill. Case adjourned pending a meeting of his creditors. Recommendation (Chesterton Board of Guardians), that (several) South Cambs villages including Harston should appoint a qualified District Nurse. Mr D.T. Fish of the Royal Horticultural Society lectured in several South Cambs villages including Harston, on growing (specified) hard a soft fruits. Jacob Wisbey, waiter, William Marsh, grocer and Herbert Marsh, grocer, all of Cambridge, were charged with being drunk whilst in charge of a horse and trap at Harston, on 27th of March. The defendants pleaded guilty. Pc Huckle stated that on Sunday night he saw the defendants on the highway in charge of a horse and trap. They were very drunk, and he would not allow them to go any further. Two of the defendants had lost their hats, and one complained of having hurt his wrist. The Bench fined them each 10s and costs, in all 13s 6d (our thanks to Graham Webster for this extract). Baptist Church Anniversary Service, public tea on Tuesday in the schoolroom and a meeting in the chapel at 7.30. Reverend F. Potter & other pastors attended, from nearby villages., and Rev Potter was presented with ‘a handsome china tea service’. Address by Rev William Higgins. Cambs Baptist Association Annual Meeting, Harston, membership ca. 76. Liberals Cycling Club, outing, Cambridge – Harston. Auction of 6 freehold cottages near The Green Man pub as directed by the proprietors. Constructed of brick, lath & plaster, tiled, good repair, yard at rear. Bounded by property of Mr J Simpson at N and W, and by that of Mr James Northfield & James Jude. They are let to Gilman, Beavis, Whiskin, Northrop & others, at rents totalling £24 pa.
To Let: The Queen’s Head pub, apply Rayment & Co., Brewers, of Furneaux Pelham, Herts. Baptist Chapel Harvest Thanksgiving, collection = £12. Trays for tea were donated by the congregation. Gifts to Addenbrookes Hospital included 2 bushels of potatoes from Mr Upchurch of Harston. Situation wanted as Junior grocery assistant. Applicant has 2.5 y experience, and is an abstainer. Apply J.C. Sheldrick (21y), Harston. James Huddlestone, landlord of The Green Man, fined 5s + costs for being drunk in charge of a horse & cart. AA Stockbridge, miller at Harston, declared bankrupt; a ‘committee of inspection’ included William Hodson, farmer. Mark Runham, farmer, fined 15s + costs for keeping a dog without a licence. Carriers to and from Cambridge include Thompson, and they run on Mondays, Wednesdays and Saturday. Skating speed test at Lingay Fen, J.R. Badcock (Harston) was mentioned for achievement. Amongst those attending an ‘At Home’ at The Cambridge Theatre Royal for the Loyal Suffolk Hussars were: Mr & Mrs Hodson & Mr & the Misses Pick of Harston. ‘Enlightenment for villages’: ‘Cambs Village Club & Reading Room Association’ formed. Reverend E.C. Baldwin of Harston was among those who pledged support. Prime Coleman, farmer, fined for keeping 2 dogs w/o licences, £1 + costs. ‘Hearts of Oak’ Benefit Socierty is to start a Medical Agency for Shelford & District including Harston + 8 other villages, entry fee 6d, subscription 1s 3d /quarter. Inquest at The Old English Gentle man (AJ Lyon, coroner) on Mary Ann Wilkes (52), found dead outside the pub, having tramped around the country with a hawker, Arthur Busby. They had both drunk 2-3 pints of beer at public houses on their way to Harston. Cause of death, ‘asphyxia accelerated by alcohol’. On 21/4 it wac further reported that Sarah Ann Coville of The Old English Gentleman was charged with selling beer to the above, then turning them out at closing time, while they wre drunk. She was fined 40s + costs. Death of Norman Capper Hardcastle MA, LLD, of Downing College, Cambridge, lecturer in modern languages, as a result of a riding accident in Harston. He was cantering on the bridleway that leads past Rectory farm when his horse tripped twice on 2 drains, he was thrown, kicked, and broke his leg. A lad, Edwin Mead, fetched Mrs Blanchard from the Rectory farm house, then Mr Middleton, surgeon, splinted the leg, but later (after 8 days) he became feverish, went into a decline, and died. Inquest at Rectory Farm, with Mr A.J. Lyon, county coroner and Mr Robert Peck, foreman of the jury. Norman’s brother attended, the medical investigation had shown thrombosis of the femoral vein, causing a large blood clot that ‘blocked the heart & femoral artery’. Jury verdict ’in accordance with the medical opinion’. The funeral was held at Hauxton church, many attended, especially family & college members. Financial assistance voted to ‘needy churches’ including Harston. Baptist church collection: £8 7s donated to the Baptist Missionary Society. A.T. Grain, auctioneer, to auction (at THe Red Lion, Cambridge) the freehold & copyhold estates in Harston by direction of the trustees of the late William Long Esq. These comprise, 160a of arable & pasture ‘with commodious residences’ known as Harston House (occupied by Mrs Green & Mr Lawrence), The Pemberton Arms & Three Horseshoes pubs, Homestead Farm House; Homestead Grocer’s & General Shop, Blacksmith’s Shop, Lime Kiln, Windmill, 11 cottages (occupied by Ashby, Lawrence, Jude, 2 Freemans, Sammons, 3 Northrops, Littlechild, Garner, Smith, Farrington & Bunn), and building and accommodation Land. The farm and homestead known as ‘Accomodation Farm, House & Homestead’ is currently occupied by Mr EC Colchester. 11.5 acres of land, formerly known as ‘Triggs’, abutting the Newton & Foxton roads, is also included. Also, arable land known as ‘Mount Field’ with Lime Kiln, 24a 1r 5p, occuped by Mr Wisbey and EC Coolchester. Also, 8a 1r 10p of land occipied by Mr Willmott. The rental for the entire esteate comes tp £355 pa. Working men’s meeting (re small holdings & allotments) in the Primitive Methodist Schoolroom, re The Smallholdings Bill. A ‘requisition under the Act’ for smallholdings ‘left for signatures of those requiring land’, will be sent to the County Council ‘in due course’. BUT (see also reports on 28/7 and 25/8), a very heated argument followed, resulting in a petition to the council from Harston – this seems to be becoming a ’cause’ celebre’. Meeting of the Liberal Association, Mr Wright moved a resolution of confidence in Mr Gladstone and the Liberal party and in Mr Hugh Hoare MP and Mr W Holman the newly appointed Liberal agent. Mr WT Rowley entertained the Histon & Impington Bicycle Club’s outing. Cricket, Great Shelfoird beat Harston by 70 runs in the first innings. 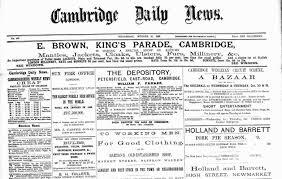 Melbourn Petty Session, James Huddleston of The Green Man was fined for being drunk in charge of a horse & cart. Superintendant Whitechurch withdrew his objection to the granting of renewal of licence to Ann Covill of The Old English Gentleman, who had been convicted of serving drinks to drunk persons. Alfred Northrop, Charles Brand, Thomas Warren,, labourers, were cleared of causing damage to an iron fence because a path had been diverted. Train stuck in a snowdrift near Harston, passengers had to abandon it, and it arrived many hours late in Cambridge. Dr William John Midelton, surgeon, of Harston, examined the body of a boy (Wilfred Edgar Griggs, 12y) who died in the river in Barrington. The horse (of a horse & cart) went out of control; the boy was thrown out, and 2 quarters of beef fell on top of him, and he could not be pulled out before he drowned. Charles Payne, cheese merchant, of Swavesey, was summoned for ill-treating a horse in Harston, with Thomas Archer aiding & abetting. An RSPCA inspector noted that the horse was lame & in pain, through chronic disease. Archer was fined £1 plus 19s costs; Payne, 5s plus 19s costs. Auction, by AT Grain, 36 timber trees (18 ash, 17 elm, 21 acacia) by the direction of Thomas Hays. Parish Council Elections, Harston has a population of 767. Auction by AT Grain for the executrix of the lte Mr Wright, household furniture from The Villa (long list of items). Alfred Freston, watchmaker of Harston, admitted stealing a silver Geneva watch belonging to Mar Rayner of Barton, which was brought in for repair but he pawned it – also watches belonging to S Farrington of Haslingfield and David Robinson of Great Shelford. 4 months hard labour. Albert Northrop, labourer, of Harston, was summoned for failing to comply with a magistrates order for his child to attend school, case adjourned for 1 month, then fined 2s. The half-yearly conference of the Sawston & District Sunday School Union was held at Harston, Rev Potter presiding. Weather forecasts (from the meteorological office), sent by telegraph ca. 4.30 pm, to Cambs villages, a new service for farmers & others. Claims are invited on the estate of James Northfield (farmer) deceased. Complaints have been made about the quality of ‘bread for the poor’ provided in Harston – poor condition, mouldy, burnt. Mr Rowley called attention to this, and noted that several parishes had complained; moreover the price charged was much higher than in Lincolnshire and delivery frequency was low. Flower show for the 7 local villages held at Harston this year at the Durbin rersidence – lengthy account given. To Let: a house with bay windows; 8 rooms, kitchen, scullery, box-room, dressing-room, WC, small garden at back. Apply Mrs Mortlock, Harston. Frank Beaton of Harston was fined 5s plus 3s 6d costs for riding a bicycle without lights. Revision Court, re parish lists – Mr Roe objected to the votes of Messrs. Lake & King, brewers, since ‘as members of a firm they cannot claim for the same property’. Mr French countered that ‘the property is the private property of the claimants’. Sale, by Messrs Chalk, on the instructions of Mr William Hodson, of wheat & barley straw at Beech Farm, Harston, from ca. 56 a, also 2 small stacks of meadow & clover hay. Sale at the farm on 12/10/94. Sale, by Messrs Chalk, on the instructions of Mr William Hodson, of 6 working horses, 8 colts & fillies; a 4y-old pony by Quicksilver, a 6y-old dun pony, a donkey, poultry including 3 turkeys, agricultural implements & household furniture. (Also: sale of land in Hauxton, at The Swan Inn). Ann Hall was fined 2s 6d for stealing part of a ‘dead fence’, property of Mr CJ Jones, from a meadow. Parade of ‘Friendly Societies of the Harston , Trumpington & Sawston Lodges, including City of Granta Court of Foresters and Royal David Lodge (Ancient Order of Shepherds). Financial help has been voted to 7 local churches including Harston (Cambs Baptist Association Autumn meeting). To let; ‘The Laurels’, £25 pa, apply T Ryland. To Let, by Messrs Chalk, on the instructions of Mr William Hodson, Beech Farm, 150 a, including 120 a of sheep & turnip land and 30 a grass, plus the house. First (ever?) Harston Parish Council Meeting, at the Board School, 60 people present Election of officers (Mr Thomas Gwilliam moved; Robert Pick seconded), the following were nominated (with no. of votes in parentheses), WT Rowley, farmer (53), R Pick, farmer (49); CJ Ives, gentleman (44); F. Willers, builder (44), J. Rodwell, farmer (34); P Hammond, labourer (28), SB Northrop, labourer (25), H Hall, carpenter (24), F Tuck, labourer (17), J Rouse, painter. The first 7 were duly elected. County council election, T Hays to represent Harston. James Rodwell was fined 10s + 7s 6d costs for twice selling coal without giving a ticket showing the weight (accused by Mr JF Bellamy, Inspector of Weights & Measures). Deat, Robert Morley ? 65y (poor legibility). Harston Parish Council wrote a letter to the Clerk of the County Council requesting that a pool of stagnant water be drained and the road level raised. The Inspector of Nuisances disagreed and suggested the water should be draind into a cesspit, to be emptied periodically. ‘Action to be taken’. Thomas Dixon, tramp, convicted of sleeping in a straw stack on 24/5, no visible means of subsistence, had rabbit nets and a ferret line but no money, 5 previous convictions, 1 week hard labour. Harston Baptist Association, membership has increased, evangelistic services, YPSCE formed & growing, Sabbath School Clothing Club & Tract Society flourishing. (re: the death of a child in Haslingfield): Mr WJ Middleton, surgeon, of Harston, said ‘the rearing of such a child would have been a matter of extreme skill’. The jury ‘s verdict was ‘starvation, but no person criminally responsible’. Mr Butler (Mr Hurrell’s gardener) entered ‘some fine exhibits’ at Little Eversden flower show. Wright & Scruby, auctioneers, are offering for sale, a brick-built Tower Flour Mill near Harston station, with residence (occupied by Mr Willmott), buildings, orchard, arable land, 2a, 3r, 34p . William Cox, conviction for being drunk & disorderly, assaulted Charles Haylock, landlord of The Coach & Horses, fined 3s 6d + 16s costs. Marriage of Henry Jude (son of A. Jude of Harston) to Amy Warrington of Fulham. Inquest (AJ Lyon, coroner) at The Swan , Harston, on Uriah Farrington, 57, farm labourer, found dead in a pond, he had been blind in one eye and was taking a short cut home, verdict accidental death. Technical Education in Cambridgeshire: Harston nominates Art. Shildrick (Harston) seeks to ‘serve in country trade’ (grocery, drapery etc), has 7 yrs experience, a Christian, abstainer, good references. Dr Middleton (Harston) attended a trap-accident in Foulmire: the trap overturned & a Mr Nunn was injured. J Winship, auction of land in Harston, 4a, 3r, 31p of planted fruit trees & asparagus, situated in the High St. The late Mr R Badcock having been the owner & occupant. Death of his wife, Harriet Badcock, announced on 25/2. Reverend Baldwin of Harston, preaching at Waterbeach. Nominee for Cambs County Counci,: Thomas Hays, farmer. Inquest on the death of a Harston infant, Harry Austin Cox, illegitimate child of Bertha Cox. He had been given bread soaked in brandy. Was a delicate child. Attended by Dr WJ Middleton. Lungs engorged, jury returned verdict of suffocation whilst sleeping in bed with mother. (see 15/9/1899, it seems the mother also died, 18 months later). Prizes for woodworking awarded to T Hayes, Edgar Chalkley. Parish constable appointment, James Rodwell junior. Harston Baptist’s public meeting, membership now 109, the highest ever since its creation, 112y before. Cycling, the ‘Wanderers’ came to Harston on 11/5/98 (their visit was repeated several times during the next few years). Baptist sermon, made reference to the sad death of Mrs Harry Watson nee Glennie, in Australia. She had done work in Harston, on ‘the Young People’s Society of Christian Endeavour’. Alfred Goode, baker, Rupert Stockbridge, electrical engineer and Percy Stockbridge, schoolboy, all fined (5s or 2s 6d + costs) for racing in Harston High Street (Horse & cart & bicycles), reaching speeds of 15 mph or more, ‘to the fear and personal danger of other persons’. Baptist’s meeting, Mrs Passmore sang a solo, good attendance. Coroner’s enquiry at The Swan Inn, on the death of Charlotte Symonds, 75, widow. (She had been complaining of ‘pains in her stomach’, so Mrs Northrop applied a mustard poultice, then some pepper in warm water ‘for wind’). Mr W. George Middleton, surgeon, saw her soon after she died, the post-mortem revealed a ruptured blood vessel near her heart. Jury verdict’according to the medical testimony’. Harston’s bridge (plus that of Conington) will together cost £423 to repair. Past Grand Lodge of Oddfelows visited Victoria Lodge for a meeting + music. President, Bro N. Symonds. Marriage of Miss Ade Durbin (youngest daughter of the late Rev FJ Durbin) to E Grimshaw of Wicklow. Reverend E.C. Baldwin preached at Sawston. Reverends D. Bruce & Potter preached at Shelford. ‘Local Industry, mention of ‘chip carving; wood carving; dressmaking & needlework, from Harston, E Covington, A Lofts, L Samuel, Eva Ive, B Jude, M Lawrance, B Ashby, A Hammond, L Levett, A Levett, T Hays, J Chapman, EM Smith. Any claims on the estate of Charles Thomas Thompson (Harston) deceased – aged 81y, – to be sent to J. Thompson, Foxton. Oliver Smith (a boy) was knocked down by a bicycle ridden by Dr Middleton and was treated for a hand injury. James Cornwell, labourer, fined 2s 6d + costs for being drunk & disorderly. James Thomas Chamberlain, surgeon of Harston, was fined 1s for riding his bicycle on the footpath on Parker’s Piece. Council has sanctioned the building of a temporary bridge (costing not > £35) while the Harston-Haslingfield river bridge is being rebuilt. AJ Challis, auctioneers, selling for executors of late Mr Thompson, ‘live & dead’ farmingstock, including horses, carts, sow, agricultural implements, furniture etc, on the premises. A.M. Robinson & Son, auctioneers, to sell pasture, 1a 1r, abutting on Church St., occupied by Mr Josiah Ashby. Suitable for the erection of a cottage. A.M. Robinson & Son, auctioneers, to sell 6 acres of oats plus milling utensils, the property of Mr D Wisbey, near The Old English Gentleman. CE Gray & Son auctioneers to sell growing crops of wheat, barley, mangolds, potatoes, nightshade, fruit, etc for the executors of Mr CT Thompson deceased. Later, his house and 2 cottages are to be auctioned, this includes yard and outbuildings (rent £15 pa). Also, stables, cart sheds, piggeries, orchards – let to Mr Skipper at £10 8s pa, and 2 clay-bat thatched cortages let to Mr J Button at £5 pa. The propery is bounded by properties belonging gto Mr Wallis & Mr Hurrell. ‘The need for… a safe supply of water is gradually being recognised by District Councils. Harston (+ 3 other nearby villages) have ….. greensand… water overflows at the surface of bore (holes). The abolition of cesspits & garbage holes, with ’good scavenging’, would improve the healthfulness of village life’. Quoits match, Harston lost to Durham, Mr & Mrs Woollard provided tea. Death of Bertha Cox at Addenbrookes, 28y. (See also 18/3/1898 and 1/4/1898, re the death of her infant 18 months earlier). Some Harston lads are forming a football club, Mr C.A. Pearce of Gt Shelford is their secretary. Wright & Scruby, auctioneers,announce the sale of a (mainly freehold) farm, half a mile from Harston station, ca. 150a, arable + pasture, plus a modern farm house (brick & slate), with large kitchen- and pleasure- gardens, and convenient Homestead, timber-built & tiled with brick foundations. Nag- & Cart- horse stable, Chaise House, large Corn Barn, Cowhouse, Sheds, Granary, Mixing Shed, Piggeries etc, 4 cattle yards & water from artesian wells. Range of cart & implement sheds. Gray & Son, auctioneers, selling furniture (70 lots) for Mr WR Brazier, and 80 lots for Mrs M Cox who is leaving. Carrier (Thompson) service to Carrier’s Arms, Cambridge, Mondays, Wednesdays, Saturdays. This page was added on 27/12/2015.